At one point, the perfume seller lit what looked like a sparkly rock. (I know now it was frankincense.) The fragrance it emitted is one I will not soon forget: spicy, warm, sweet, and vanillic. It was magical. With this in mind, I was looking forward to my Miniature Perfume Shoppe shipment of Samsara, Guerlain's ambery Oriental perfume highlighting jasmine, ylang-ylang and sandalwood with a warm tonka and musk base. Alas — disappointment. In terms of making the most of its Oriental notes and expressing in perfume form the Buddhist notion of "samsara," (the endless cycle of birth and suffering and death and rebirth), Guerlain's strangely inert and wishy-washy Samsara is a missed opportunity. How do you mess up (and messing up includes the cardinal sin of being boring) a perfume with such rich ingredients and such an evocative name? Perhaps it was perfume by corporate committee, a bunch of suits putting together ideas and notes intellectually but without passion? Samsara is a polite jasmine scent with with a slightly spicy Oriental base. Maybe it's just me, but I really don't get much else. Not every fragrance has to have a story or a mood — but a personality would be nice. In Buddhist thought, samsara has a number of meanings. It can be the inevitable chain of birth, life, death, reincarnation, or it can signify the cycle of suffering Buddhists believe occurs as a result of our living trapped in delusions, endlessly seeking gratification and pleasure. If Samsara had been more interesting, it could have used its interesting notes in some way to express one or more of these meanings of samsara — either by contrasting decadent notes with austere ones to represent the pleasure/pain of samsara, or by overloading on decadent notes to signify samsara's indulgent connotations. Instead, Guerlain decided to make up its own Bizarro World definition of samsara. (Samsara as "serenity." Really, guys?). 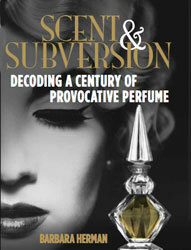 Even with that revision, I'm not sure how the perfume's notes signify or play off each other. Just to get a sense of how bland Samsara is — pick up any Serge Lutens Oriental fantasy fragrance (Chergui, Arabie, Muscs Kublai Khan) and compare it to Samsara. It's the difference between "meh" and "Oh, my God what is this?" So you know how I feel about this perfume that's been stripped of any significance or edge, connotatively or olfactively — let's now take a look at the advertisement. Ad execs may have wanted to project "a sense of serenity," but all I see is a strangely-coiffed lady-bot who looks like she's on 'luudes. Oh, the '80s. (TDDanae likes it): "The beautiful smell of Sandalwood and Vanilla are toned down ever so slightly with Jasmine and Ylang Ylang. It does not smell floral, but the florals are just barely there enough to take any sharp edges off the Sandalwood and Vanilla. This ends up being such a delicate oriental blend that I certainly hope they never quit making it or change the formula because it is just perfect." (Angelica dislikes it): "Some years ago I worked at a major museum where we would have big galas, and most of the ladies who attended were very wealthy and of a certain age. They all had near-identical ash blonde heavily highlighted, big, highly coiffed, hair. A hair helmet really. We took to calling this 'international hair,' which carried with it a whole host of associations. And so I have come to the conclusion that Samsara is the oriental for women with international hair. It is well-mannered. And lest that indolic jasmine or sultry sandalwood should offend, there is a massive overlay of orris to keep it all in place, just as a robust application of Elnett will do for your coiffure." I sent you an email in response to the question you asked me, I hope you got it! I still haven't smelled Samsara, but I admit it's never really appealed to me. I actually agree with all you wrote about Samsara. But I must add there exists the other side of this perfume, the positive side. Ayala's review helped me to know how to like this perfume. One day I sprayed on fabric a little of a Samsara extract I got on the internet, and that was utterly lovely. Lovely don't seem to fit to Samsara, doesn't it ? Yeah, the EDT had some crude synthetic sides, and the EDP is even worse. One can feels that there is a talented use of powerfull jasmine and sandalwood, but spoiled by the rest of the composition, wich appeards like a boiling brew of dangerous synthetic. In the extract form, it seems that were added enough naturals to calm down the raging hormone of the EDP. It's quitter than EDP, and can begin to pretend to be classy. Up far on fabric, there is a good bergamot top note, and through the prism of this bergamot, everything that failed succeeds : the floral zisty bergamot, the exosticism of jasmin, sandalwood succed to induce serenity, and a touch of peach make it so sensuous. A warm seducing lulling feeling. But up close, there is still this shattered-pottery smell of polysantol, and rubbery and plastic harshness. Though I don't like its harshness, we must concede Samsara's success (to the point of being the second Guerlain's best seller after Shalimar) was due to this conspicuous silage, that please women of this era. And I like the advertising. The image is all about texture, the red so red it seems creamy, the silky dress, the wood building. Maybe the woman was not chosen so attractive so that we focus about the atmosphere. Julien, Thanks for your comment and your link to Ayala's post. I liked her analysis of the cyclical nature of the woods/florals/sweetness, the perfume analogy of the Buddhist cycle of Samsara. Perhaps I should give other formulations a chance (i.e. the extrait), because for me Samsara just didn't hang together. I want to smell the "touch of peach" you mention that makes the perfume sensuous. Thanks for stopping by! I wore Samsara yesterday, to confound my remembrances to reality, this time I mostly caught the clove's stage (and not the bergamot), and I liked it. Samsara belongs to this strange category of perfume I just like, but wear sometimes for a day long. It's strange, compared to the perfume I love but rarely wear because I'm never in the mood for. And those perfume impeccable from A to Z that don't move me. If I should analyse, I would say Samsara have smells that are good for my mood. I mostly know the opposition situation : "Une rose" and "Ubar" are perfumes I really like, but when I wear them, they erode my good mood, it's an involuntary physiological reaction, a compound in them set me in an irritated mood. It takes only 5mn for stimulation to leave its place to irritation. Scrubbers (and I bought the bottles ^_^!). I used to loathe Samsara to the point that it almost made me ill. Now I adore it. Go figure! I get jasmine and sandalwood and find it gorgeous. The key is in the application. The parfum (vintage pre 90s formula) dabbed on is divine and has little sillage, like velvet in a bottle. The vintage edt, lightly misted, also beautiful. The edp is just too electric for me. Hi Daly Beauty. Samsara is one that I need to try again. A few people protested my bad review, which makes me think that either we just have different taste, or I have to get another batch. Perhaps the parfum as you suggested. Thanks for visiting YP and I'm so glad you like reading it! Samsara smells a lot like Tuscany to me. Anybody else get that? If I dare say it, i'd say give SAMSARA another chance. it grows on you, and one mustn't compare it to, say, SHALIMAR. With that listing of HEADnotes--- bergamot, lemon, green note, peach, tarragon---- you might almost think you were in for a 1950's Dior or Patou. Apparently it's been reformulated. Back in the day, Samsara was my jam! I'd load myself up in that shiz and be jackin' to some Dee-Lite and C+C Music Factory up in da club and those were the DAYS! Oh, we had fun in our heavy sillage and bicycle shorts. You had to be there, co-mingling with the Amarige and the Ysatis and the Fendi like a big bazaar. This was Chicago, we would go from shopping on Michigan Ave to the clubs. What an era!